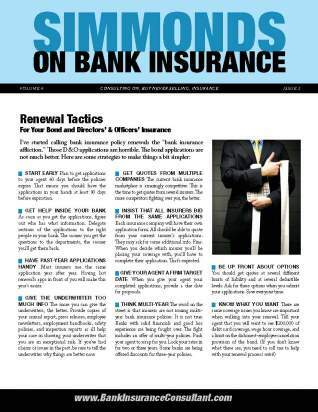 My University of Bank Insurance is your source for assistance, info, and help with all bank insurance issues – insurance for bankers who buy insurance for their banks. 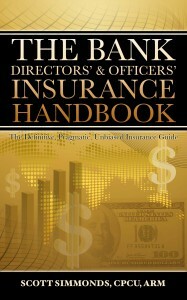 The Definitive Handbook For Bank Directors and Officers – published in 2013. My latest thinking on the topic. It contains information geared to community bank directors. What coverage is a part of the policy? What are common exclusions and issues to worry about? How does personal insurance provide coverage? (It doesn’t.) Questions to ask your insurance agent. General marketplace info. The definitive guide to bank directors’ and officers’ insurance. Six times a year our subscribers get insurance advice and information not available anywhere else. 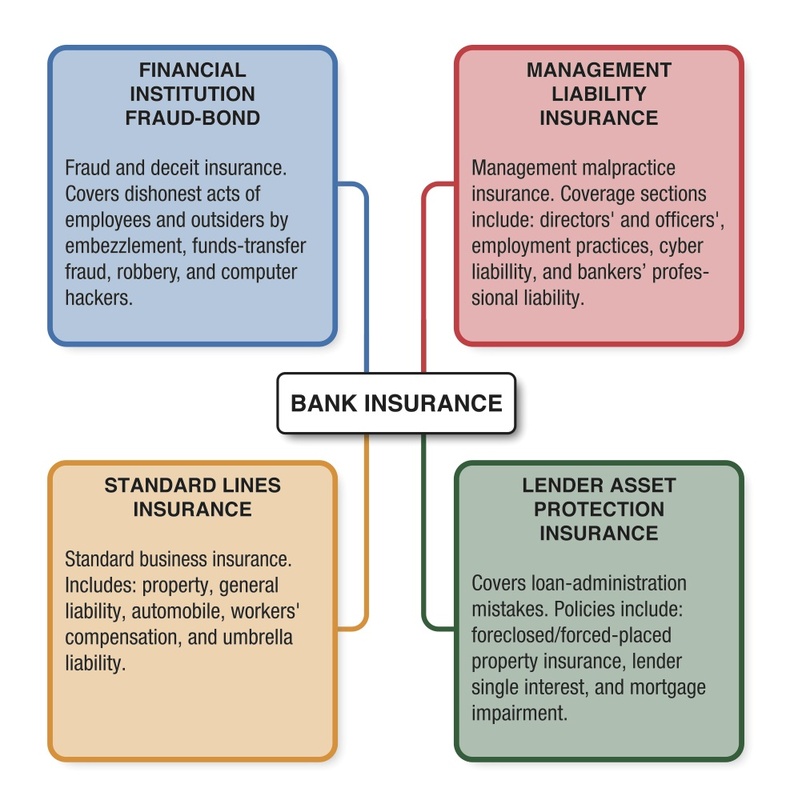 Topics are geared to the needs of bankers who manage the insurance for their banks. How Much Insurance Should Your Bank Buy? A bank with ten branches and no extra expense coverage on any of them. Property insurance policies with coinsurance penalties that kick in after a loss. Incorrect listing of insured entities on the liability, auto, and umbrella policies. No debit card fraud coverage on the financial institutions bond. No safe depository insurance on a bank’s six locations with safe deposit boxes. Low directors’ and officers’ limits of liability combined with inadequate aggregate limits of coverage. A bank with several missing locations from their package policy. A bank insurance plan with inadequate e-banking protection but exceptionally low property deductibles. Poorly written employment practices coverage that did not cover workplace harassment. No coverage on repossessed vehicles on the auto insurance program. No coverage on a bank parking garage where over fifty cars were parked all day. Inadequate umbrella liability limits of coverage, plus no coverage for foreclosed properties. The questions I get most often about the insurance review process. How it works and what is included. What is my approach? What issues do I address? What’s the time-line? A reprint of my article from Maine Community Banker. From my writtings for the RMA Journal. The day-by-day timeline of an unbiased review of bank insurance coverage. What happens and when in the process. Your bank’s insurance premiums have gone up. An insurance consultant can help you find the right insurance at the best price.